FIND OUT WHAT OUR CLIENTS SAY ABOUT US, AND HOW WE'VE EARNED OUR REPUTATION FOR QUALITY. We understand that it’s not every day that you commission bespoke work. That’s why we think it is important for you to be able to see examples of our work, and hear what previous clients have said about us. 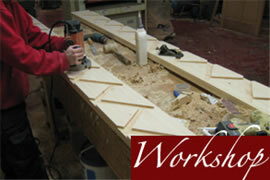 You are welcome to visit our workshop. If you arrange your visit in advance, we can advise whether we are currently making something similar to the product you require. We also have a couple of sample pieces we can show you. We have tried to display a wide variety of photographs from our portfolio of work on our website, but we have many more on our database – so please ask if you can’t see what you’re looking for.